It is always a good idea to have some linking for the interior, exterior as well as the outdoor spaces. Doing this creates the oneness and coherence in the house. We have seen how designers did this in many homes that we have already featured. But for this house that we are going to show you today, it showcased the value of the interaction of nature all over the house. 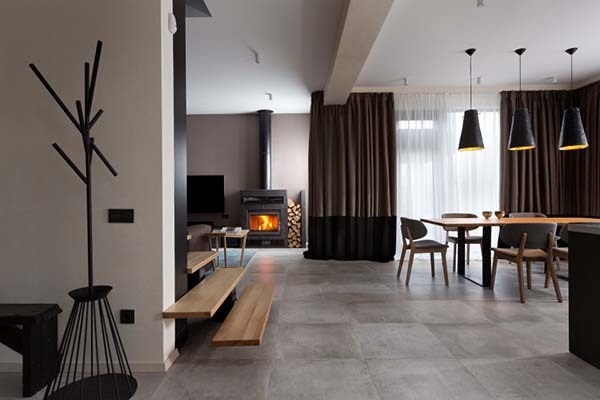 The Buddy’s House is a striking modern home located in Gorenichi village, in the Kiev Oblast of central Ukraine. 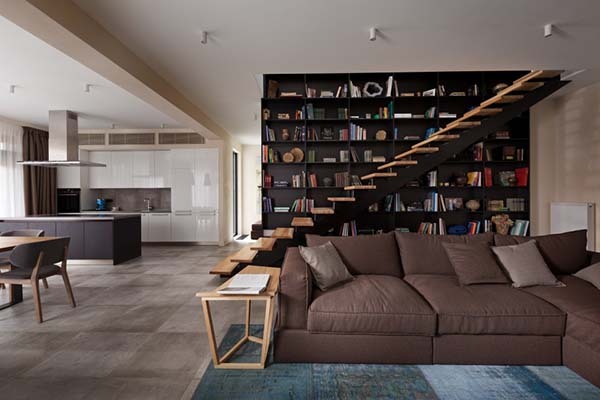 This 2,529 square feet (235 square meters) living space creates a “unique environment where simplicity, coziness and harmony are fused together in a modern shell”. The interaction of external and internal areas is highly important in the project. Designers said that “the distinction between them is eliminated due to a large-scale vitrescence of public zone and owner’s bedroom located on the second floor”. For this house, the architects aimed to bring nature into the interior and they even utilized it for the exterior. On facade of the houses exterior, it has a decorative wall that is made from natural oak creating a contrast with the help of a deep dark tone of the main surfaces. 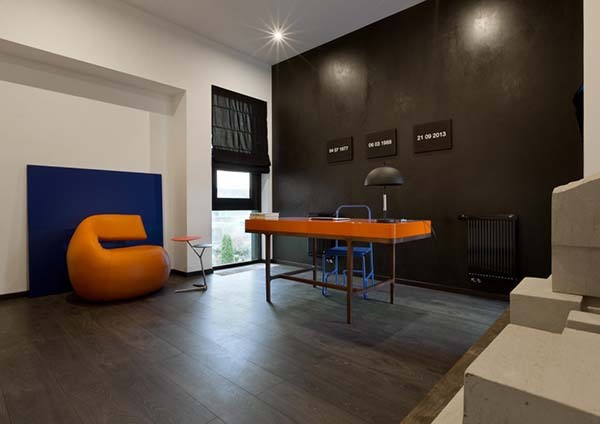 One of the main themes of the design of this house is contrast which we can see all over the exterior. 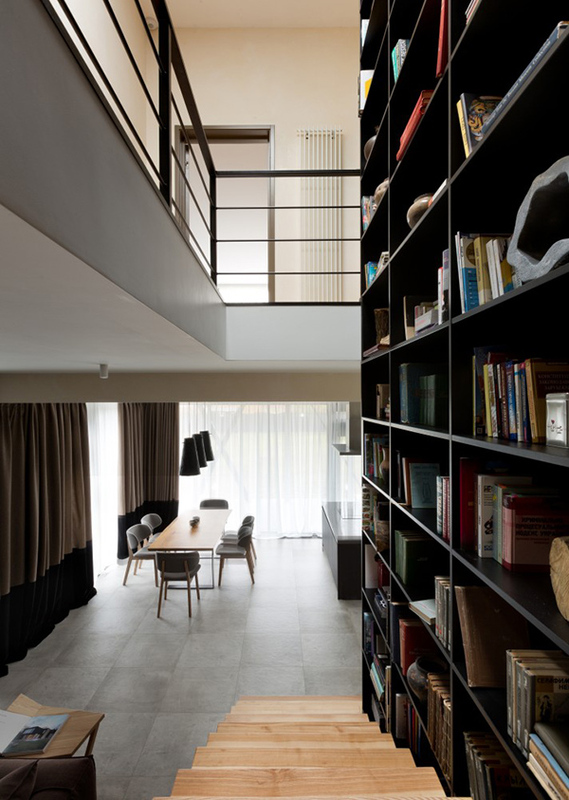 In this house, we can see “thick and fragile forms, heavy and light elements, black brick and light-toned cement blocks, textured and smooth surfaces”. Ironically, this house was able to use contrast to unify the forms and nature. 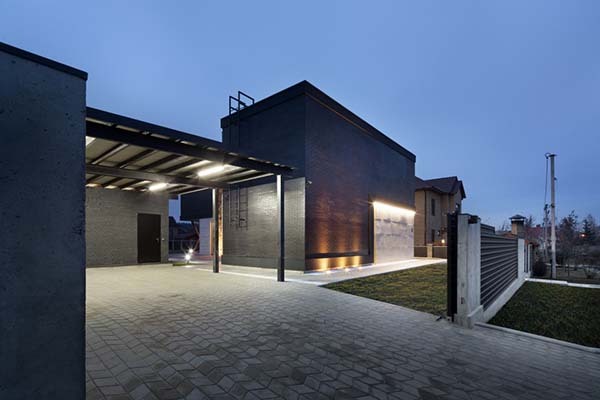 A functional additional building is used as a place for rest, barbeque-zone, shed for a car and housekeeping area. You will be welcomed to a very temperate and simple interior that consists of numeral practical concepts like the tabletop quarzite that will last for years. 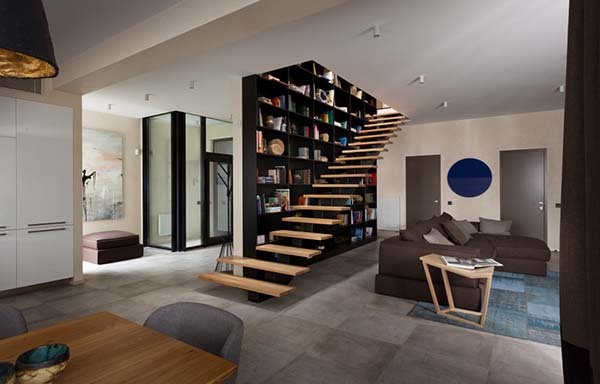 Light wooden stairs is used to access the upper areas of the house. The house has an open layout seen in this image for the dining and living areas. The double-stored library and child’s room are illuminated by the sun coming from light tubes in the ceiling during the day. When night time comes one can choose the kind of lighting from bright basic or soft decorative. 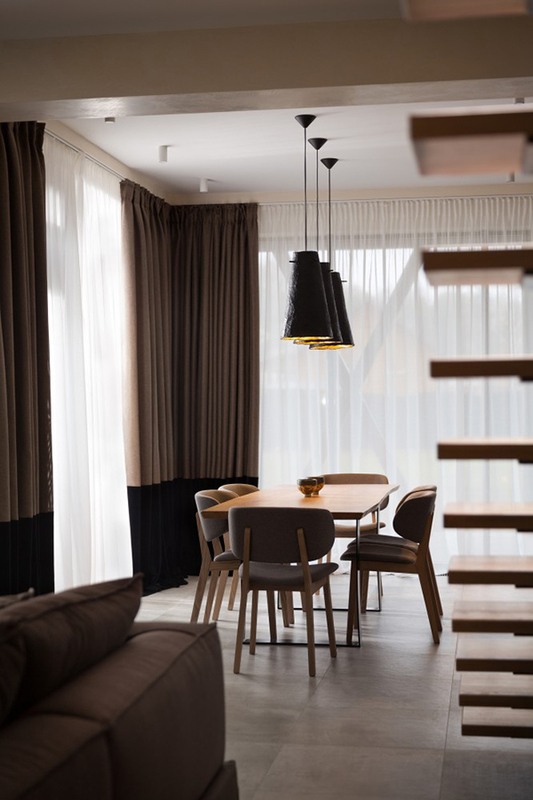 What adds to the beauty of the dining area are the pendant lights above it. The height of the ceiling as well as the glass windows made this home bright and airy. There is a bedroom for guests, wardrobe and en-suite on the ground floor of the house. This is the ensuite of the guest bedroom that would make them feel like they are in a hotel. This is the working area of the house with pops of blue and orange. 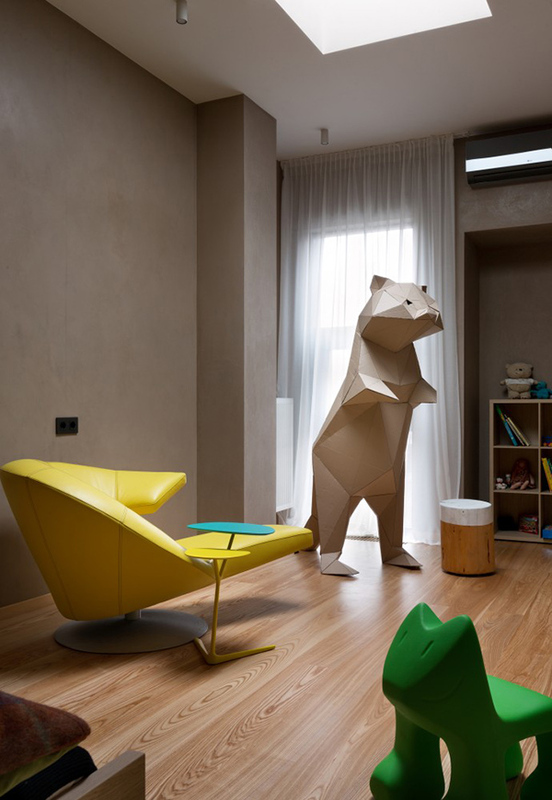 I like the looks of this part where a sculptural bear and a sculptural chair are seen. 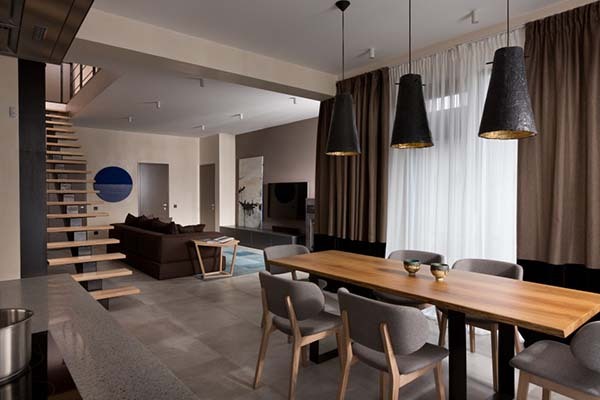 Don’t you love the desing of this home by Sergey Makhnoa? The idea of Sergey was supported fully by the home owners and they were able to get the kind of home that they always dreamed of. I like the design of the exterior as well as the idea of having a modern courtyard. Even the interior of the house is breathtaking and cozy too. What are your thoughts about this home?